with Michael Terral, Historic Washington State Park staff member, and Aaron Dovell, park volunteer. 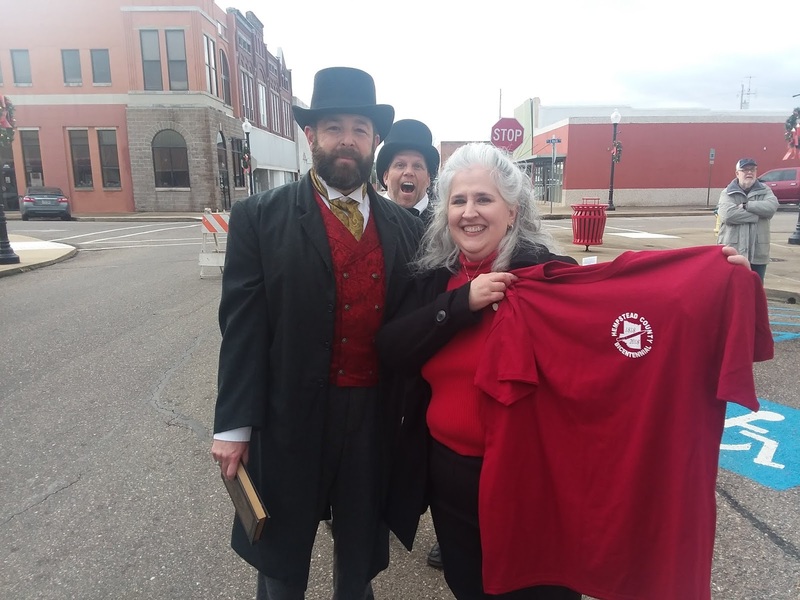 Hempstead County residents celebrated the county’s Dec. 15 bicentennial birthday with cake, fireworks and a parade. 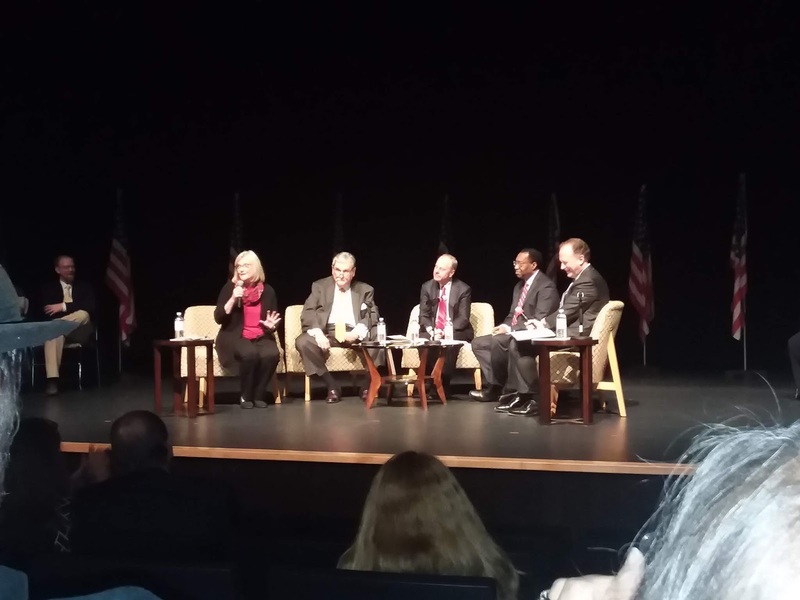 Nesbitt and other former and current county and state officials attended the two-hour event. 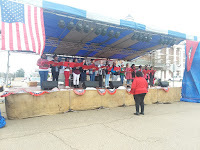 Festivities included a parade, music, vendors and games. Celebrations started at the University of Arkansas-Hope campus and moved to downtown Hope at the Farmers Bank building, which is set to become the county’s new courthouse. The event ended with a cake cutting and firework display. Hempstead County became one of Arkansas’s first five counties Dec. 15, 1818. The county was created from what was the Missouri territory. The five original counties became the Arkansas territory in 1819. 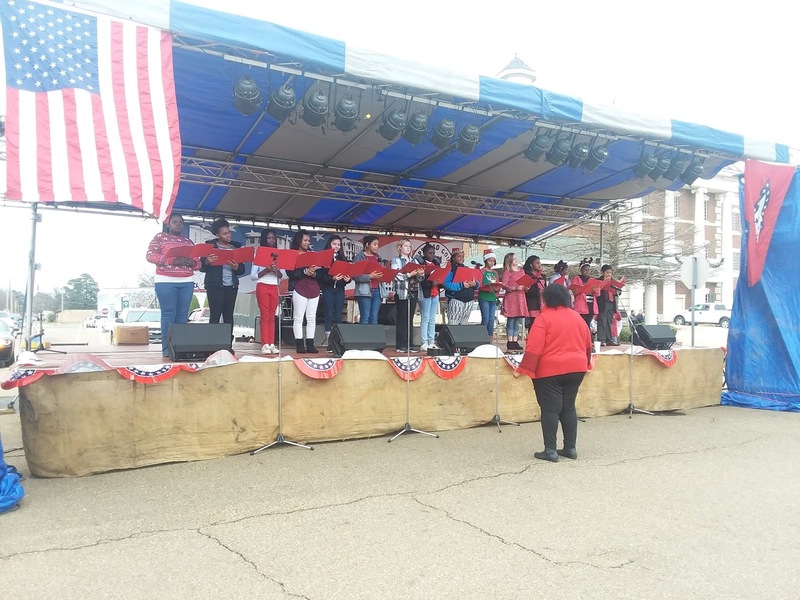 Hempstead County has produced renowned public officials, including former U.S. President Bill Clinton, who spoke about the county’s birthday via video posted on social media. Speakers at the event included Hempstead County natives Mack McLarty, who served as Chief of Staff for President Clinton; Judge Lavenski R. Smith, Chief Judge of the U.S. Court of Appeals for the Eighth Circuit; Little Rock attorney Joe Purvis; and Ellen Turner, a professor at Northwest Arkansas Community College in Bentonville. Hempstead County originally included all of southwest Arkansas and parts of present-day northeast Texas and southeast Oklahoma. The county was eventually divided into 12 counties, including Columbia, Hempstead, Howard, Lafayette, Little River, Miller, Nevada, Ouachita, Pike, Polk, Sevier and Union. For more information, contact SARA at 870-983-2633 or southwest.archives@arkansas.gov. former SARA manager, inside the Archives booth. It’s the New Year and time for a new round of Pen to Podium lectures! Dr. Blake Perkins will discuss the history of defiance unique to people in the Ozark Mountain region at 6 p.m. Tuesday, Jan. 15, at the Department of Arkansas Heritage at 1100 North St. in Little Rock. The lecture is free and part of our 2019 Historical Writers’ Lecture Series. The Friends of the Arkansas State Archives plan to host a reception with refreshments 30 minutes before the lecture. Perkins’ book, Hillbilly Hellraisers: Federal Powerand Populist Defiance in the Ozarks, has drawn praise for its insightful look into how rural people in the Ozarks reacted to and resisted federalism in the 19th and 20th centuries. The Ozarks includes parts of Arkansas and Missouri, where people have a reputation for anti-government sentiment. Perkins’ book asks what role heritage plays in perpetuating that attitude and focuses on real people’s experiences. The book traces social and political changes from the Populist revolt of the 1880s and 1890s to the modern-day Tea Party protests and the popularity of President Donald Trump. “I think one of the most unique aspects of Hillbilly Hellraisers is the way in which it takes several local ‘case studies’ over time and extrapolates from them broader historical patterns that can help explain some of the big questions of American political and social history,” Perkins said. Perkins’ research uses “microhistory,” or a method of looking at individual lives in a historical moment. “If former Speaker of the House Tip O’Neill was correct in asserting that ‘all politics is local,’ zooming in to examine the local level ought to tell us a good deal about how political history is actually made,” Perkins explained. There has been growing interested in rural America, including the Ozarks, since the 2016 election of President Donald Trump, Perkins said. Perkins’ book encourages people to think differently about the past and how politics have evolved. “I think in many ways the Ozarks is an excellent microcosm of rural America in general,” Perkins said. Perkins was born in the Ozarks and grew up on a fifth-generation farm near the southeastern Ozarks in western Lawrence and Sharp counties. He became interested in his family roots and history in elementary school. 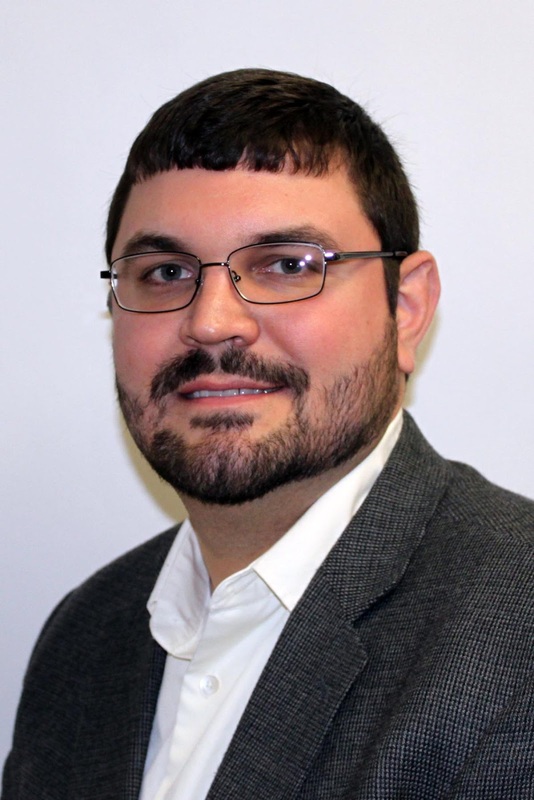 He has since become an assistant professor and chair of the History Department at Williams Baptist University in Walnut Ridge. He earned a bachelor’s degree from Lyon College, a master’s degree from Missouri State University and a doctoral degree from West Virginia University. Perkins said the history behind local politics and its evolution is fascinating. “As I watched anti-Obama, anti-Washington politics surge in Arkansas between 2008 and 2016, I’ve been fascinated to investigate and learn more about rural political and social history,” he said. We are pleased to showcase new collections coming into our archives! This month, that includes love letters found inside a wall in a Little Rock home. · Graves, Rosie Collection: These love letters, dating 1945-1946, were found in the wall of a home. Graves, of Little Rock, sent letters to Jose Anthony “Tony” Pagan Roman during Roman’s military service at Camp Robinson in North Little Rock. She also sent letters during his service in Guayanilla, Puerto Rico. The collection includes a handkerchief, letters to Tony’s sister in Guayanilla, Peurto Rico, and one film negative of an unknown girl, boy and toddler. The collection was transferred from MacArthur Museum. · Arkansas Department of Parks and Tourism – Executive Office records: The parks records are a mix of correspondence, news releases, construction bids and documents on groundbreaking events for buildings. The documents cover Village Creek, White Oak Lake, Withrow Springs, Woolly Hollow, Pinnacle Mountain, Plantation Agricultural Museum, Poison Springs, Powhatan Courthouse, Prairie Grove Battlefield, Queen Wilhelmina and Toltec Mounds. The department plans to transfer more and similar records to our archives soon. Our library is open and available to the public from 8 a.m. to 4:30 p.m. Monday through Saturday at 1 Capitol Mall, Suite 215, in Little Rock. You can also donate material by visiting our website or by contacting Julienne Crawford, our collections services coordinator, at julienne.crawford@arkansas.gov. 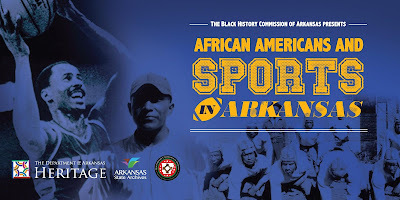 'African Americans and Sports in Arkansas' Set for Saturday! Four important speakers will discuss the history of African Americans in Arkansas sports during a free event this February. The Black History Commission of Arkansas will present “African Americans and Sports in Arkansas” from 9:45 a.m. to 3 p.m. Saturday, Feb. 2. Check-in begins at 9:15 a.m. Get tickets through our Facebook page or at Eventbrite. The event is free and is part of celebrating Black History Month. Lunch will be provided to the first 125 people who register. Lunch is not guaranteed after that. Speakers Evin Demirel, Jimmy Cunningham, Jr., Dr. Wilbert Gaines and Kenneth (Muskie) Harris will give insight into the contributions of African Americans in Arkansas’s sports. The event will include personal experiences. Demirel is a Little Rock native and author of “Arkansas’s African-American Sports Heritage.” Cunningham, a Pine Bluff native, wrote “African Americans of Pine Bluff and Jefferson County.” Harris is among the first black football players for the University of Arkansas and remains involved in the Central Arkansas community. Gaines is among the first black faculty members at Arkansas State University and was one of the state’s first black referees. The event will be held at the Mosaic Templars Cultural Center at 501 W. Ninth St.in Little Rock. Teachers can earn up to four professional development hours. The Black History Commission of Arkansas is a board of the Arkansas State Archives, a division of the Department of Arkansas Heritage. The commission seeks to raise awareness of the contributions and impact black Arkansans have had on the state’s history. Learn more about our speakers and get the agenda on our Facebook page! For more information about commission, visit http://archives.arkansas.gov/about-us/bhca.aspx or contact Tatyana Oyinloye, African American program coordinator, at 501-682-6892 or tatyana.oyinloye@arkansas.gov. It’s the time of year when people think about what has passed and plan their new year. Historically, that contemplation often included religious faith. 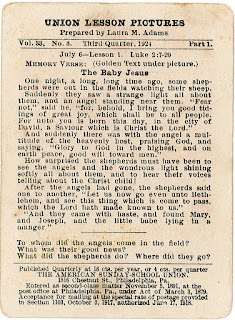 The Northeast Arkansas Regional Archives has about 220 Bible school study cards, which were used as lesson supplements for children's Sunday school classes. 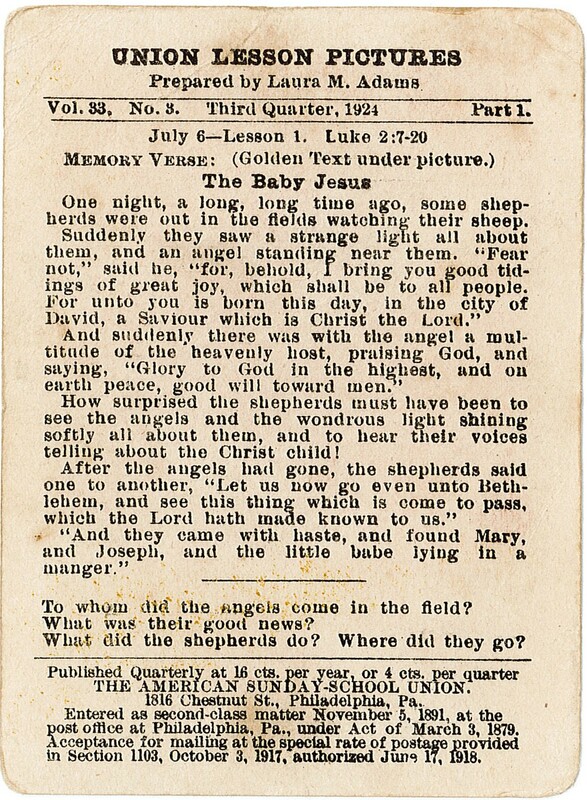 The bulk of these cards date from 1922 to 1934. Each card shows an image to illustrate a lesson and a Bible verse. 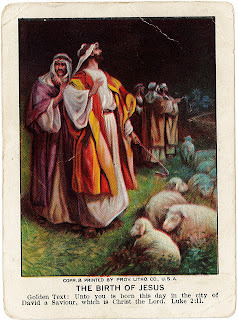 The card has a simple explanation or story on the back. Attending Sunday school was common in early 1900s Arkansas. About 80 percent of the state's population identified as Baptist or Methodist. 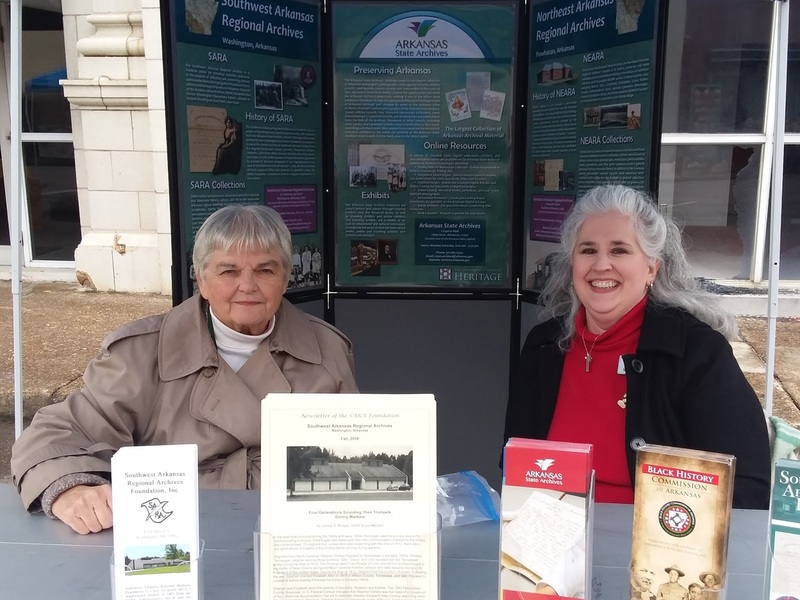 The Louise Smith Parrish donated the card collection to Powhatan Historic State Park. In 2011, the Arkansas State Parks gave the cards to NEARA as part of a larger donation on northeast Arkansas history. To see the collection, visit NEARA from 8 a.m. to 4:30 p.m. Tuesday through Saturday at 11 Seventh St. in Powhatan. In other news, the deadline to apply for the NEARA Award for Exemplary Archival Research is Feb. 1. The winner earns $1,000! For more information, visit http://arkansashistoricalassociation.org/?page_id=19. We, also, are accepting volunteers every day! Come by and we will teach you how to handle archival materials and make those records more accessible to the public. You can help us preserve our heritage! Currently, volunteers are unfolding and processing court case files from the Walnut Ridge, Lawrence County Court Records Collection. The goal is to have the cases searchable in our database within the next year. For more information about volunteering, contact NEARA at northeast.archives@arkansas.gov or 870-878-6521. “There’s gold in them thar hills!” could be overheard in Arkansas in the 1800s. Various places in the Ouachita Mountains proved to be a source of gold, silver and other valuable minerals throughout the 19th century. One man wrote as early as 1803 of a gold mine near the Ouachita River and reported government officials had been told about the gold 40 years earlier. 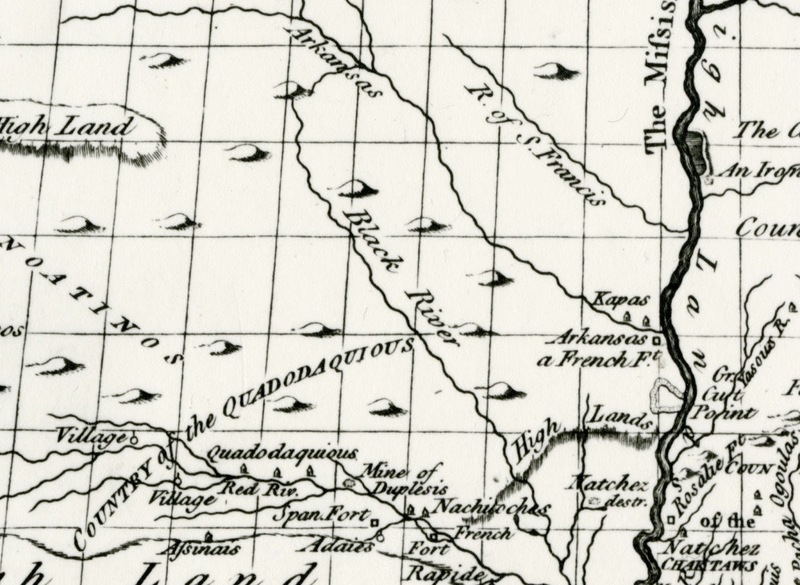 In his book, “Memoir on the District of Ouachita in the Province of Louisiana,” Charles Francois Adrien Le Paulmier D’Annemours, who was the “former Consul General of France in America,” recorded what he learned about gold in the upper Ouachita River Valley. D’Annemours (also spelled Danemours, d’Anmours, D’annmourr or D’anmourr) was born in 1739 in France. He came to America in 1777, supported the colonies during the Revolutionary War and moved to Louisiana in 1796. He settled in what is now Monroe. 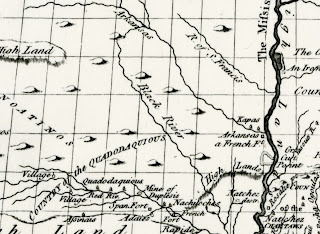 According to D’Annemours, another account of why the mine was abandoned was out of “fear of savages of the Osage nation — a very belligerent, bold and cunning tribe.” Either way, the attempt at gold exploration in the Ouachita Mountains ended. No one tried again. D’Annemours died a few years later, likely about 1809. His original memoirs are preserved by the American Philosophical Society, Philadelphia, Pennsylvania. D’Annemours’ records were translated and annotated by Samuel D. Dickinson of Prescott. Dr. Wendy Richter, state historian and director of the Arkansas State Archives, edited the translation. The Clark County Historical Association published the book, which is viewable from 8 a.m. to 4:30 p.m. in the research room of the State Archives at 1 Capitol Mall Ave., Suite 215, in Little Rock. John Jefferson DuLaney was born February 5, 1885, to the Reverend Thomas DeLaney and his third wife, Elizabeth Amanda Casey. John DuLaney graduated from the University of Arkansas at Fayetteville. He taught at Ouachita College as well as the law schools of the University of Texas and Vanderbilt. He served as a legislator from Little River County and served as a state senator, 1923-1925. He also served as a prosecuting attorney and practiced law for thirty years in Ashdown, Arkansas. DuLaney died November 11, 1945. This collection contains correspondence regarding laws and regulations in other states as a guide for legislation DuLaney possibly wanted to draft. Other printed material includes a campaign broadside for DuLaney and legislation from Michigan. o  "Dulaney favors relief in road tax situation..."
o Undated: "State Educational Institutions"
o Notice No. 2: Claim for Amounts Due Deceased Personnel of the Armed Forces of the U.S.
o 1945 June 21: Times Dispatch, Walnut Ridge, "Buddy Tells How Pvt. Colbert Met Death"
o "Powhatan Soldier Killed In France; Awarded Medal, Is Also Commended"
o "Last Rites for Billy J. Cobert"
o "Silver Star To Heroic Soldier"
o Parcel wrapper from package sent by Hubert Colbert to Billie Jewel Colbert, returned to sender, marked "Deceased"